She's Sew Crafty: Whimsy Stamps- March Rubber Stamps and Die Sneak Peek Day 3! Whimsy Stamps- March Rubber Stamps and Die Sneak Peek Day 3! 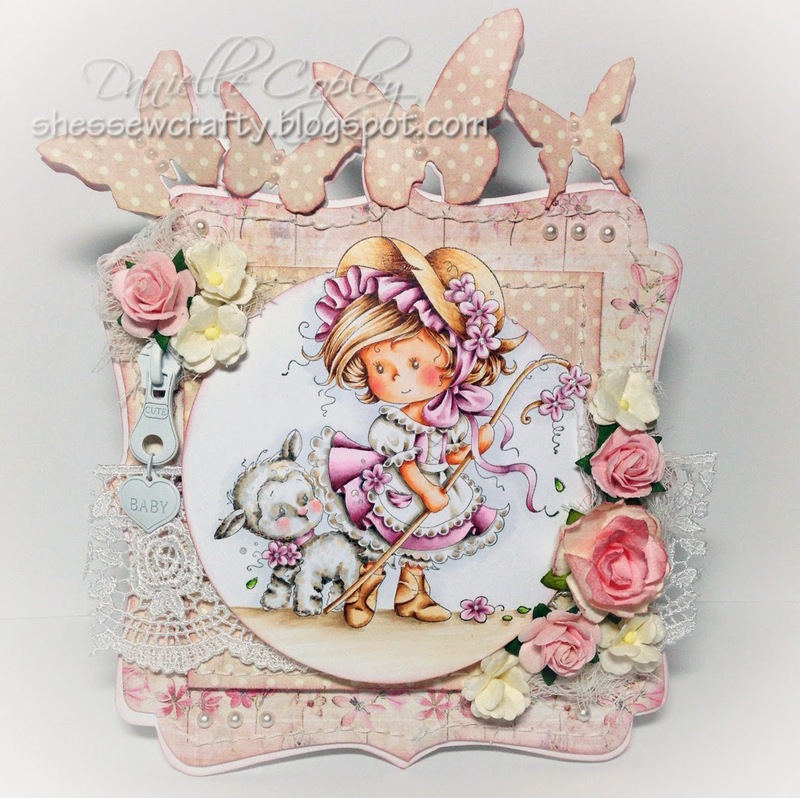 Welcome to the Whimsy Stamps March 2014 rubber stamp and die release BLOG HOP! This month, Whimsy has something extra for you! Kit & Clowder is an online coloring community run by Alyce Keegan. 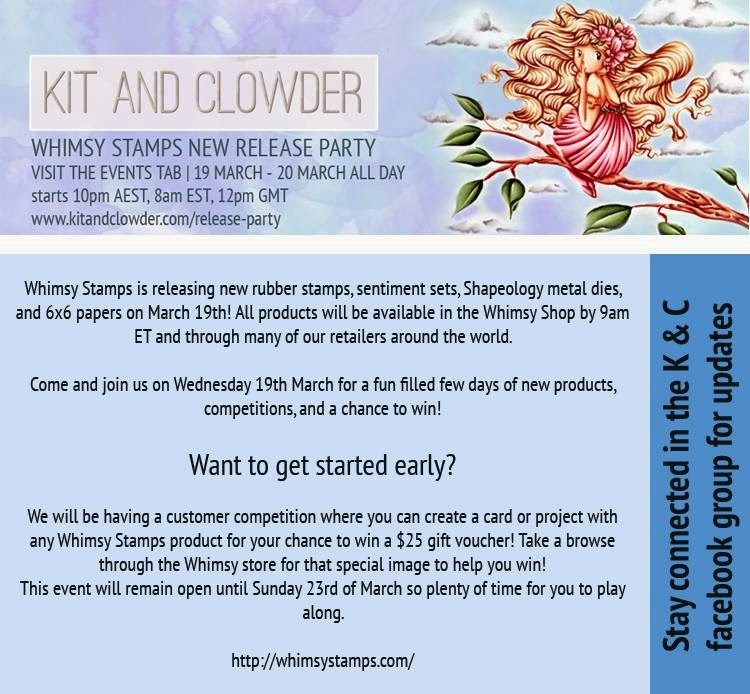 The Kit & Clowder DT are hosting a special joint release party event today, which includes a special blog hop showcasing Whimsy’s March release. So today's Whimsy DT are also sharing their creations in this second hop! There is a $25 gift voucher up for grabs as a prize for the Kit and Clowder release party, and details of how to enter can be found over at Kit & Clowder. For today’s card I inked up an adorable image by Wee Stamps for Whimsy Stamps called Mary. I tried my hand at cross hatching my strokes to make the hat straw like. And I did my best to make lambs fur. It's hard!! Absolutely gorgeous. I think your colouring is amazing. I love your woolly lamb and her sweet pink cheeks. This is so gorgeous, Danielle! Fabulous coloring of the sweet image! This card is adorable, love the soft colors and the lamb is so sweet. Great card!! Wow!! I love this stamp and your colouring is amazing. I can't stop looking at it. Gorgeous. Such a sweet card, Danielle. Great work on the cross hatching and fur. And I love, love, love her hat! And I want the butterfly die now, too! Beautiful perfect little Easter card! Wow! Amazing coloring and stunning card! You did a superb job with Mary's hat, I can see the straw texture and your lamb definitely looks fluffy so no need to worry! Very sweet card, well, this is more like a creation than a card! It's magnificent! This is so beautiful Danielle. Gorgeous coloring!! Such a cute girl <3 Wonderful coloring!! Soooooo beautiful and you did a fab job on the lamb! wow nice coloring. so cute! I really love how soft and sweet this is...that little lamb is just adorable! Gorgeous job. Love the soft tones in this, wish I could accomplish this look. (I'm too heavy handed.) Great cross-hatching on the hat. What a sweet little card! I love your colors and embellishments! Your crosshatching is so fine! I love the look it gives; and your lamb is super cute! Stunning work!!!! Just gorgeous colouring!! The image is so cute love your card and the colors. Stunning card Danielle!! Fabulous coloring and I love the lace and the flowers, Beautiful. WOW! This is stunning! I LOVE the sweet image, such wonderful colouring and full of gorgeous detailing too. Great No line Technic. Love it. Mary is so adorable! You did a fantastic job, just love her. So so sweet!! The image & card is beautiful. Beautiful card Danielle. Such soft and pretty colouring. I am so in love with this sweet little image. Adorable! WOW, so much detail, Thank is just amazing. Thank you for sharing!!! Danielle this is just precious. I am about to color the same image for a GDT Wee launch and just seeing her all colored up like this gives me inspiration. Just beautiful work! Thanks, Melanie! I can't wait to see your version! Squeeeeee super duper cute!!!! I love this image and I love you have put the whole card together!!! Ohhhh - I think this is my favorite of the new images (so far :o) ) ! What a gorgeous card! Thanks for the inspiration. Wow, wow, wow!!! Fabulous card. I love Wee images and this is one of the cutest. Amazing job in the delicate coloring and love the design of your card. totally amazing card...I mean wow!!! Fabulous---fantastic coloring!!! Sweetest image indeed...just love SZ!!! Pretty card...embellished so nicely!! Fab card!Great job with the coloring! Omgosh, I don't have words for how gorgeous your card is. Every detail is flawless. Adorable!! The image is sooo sweet! Love your card!! I want to hug your little lamb...it is so cuddly looking...Thanks for Sharing your amazing talent! Stunning! I love every little detail! Love the soft pastel colors and the die cut shaped card. She is so sweet and you colored her perfectly! Love it! Such sweet innocence!! You've made the most gorgeous card to highlight her perfectly! I really like her, might just end up buying it in a hurry if I listen to myself ;-) thanks for the inspiration! Your card is so cute! I love wee stamps and that is beautiful and your colouring too! Wow Danielle, gorgeous colouring and love the layout. Wow, what a beautifully colored card!